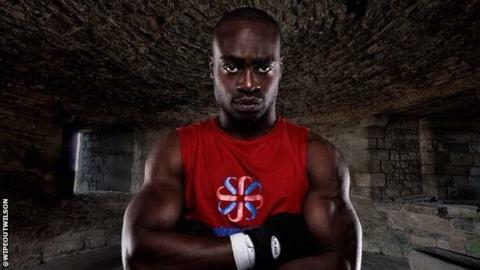 British boxer Jerome Wilson is out of the medically-induced coma he was placed in after having an operation on his brain last week. Welterweight Wilson, 29, was knocked out by Serge Ambomo on Friday, 12 September, and suffered a head injury that required surgery. Promoter Dave Coldwell told BBC Radio Sheffield: "He's made unbelievable progress these last three or four days. "He is out of the coma and each day he seems to be getting stronger." Coldwell said Wilson had been taken off the critical list and was now being described as "high dependency". He added: "It's all about rehab now and he can't quite move or speak at the moment but he is aware of what people are saying to him." Ambomo reportedly knelt down over Wilson and kissed his head after delivering the knockout blow, unaware his opponent was seriously hurt. Before the fight, Wilson had a record of eight wins and two losses since making his professional debut in February 2010.